No gas, no exhaust emissions, no power cords. The future of lawn care is battery – and STIHL is leading the charge with our full line of battery-powered products. This line of battery-powered equipment uses no gasoline, creates no exhaust emissions and requires no power cords. 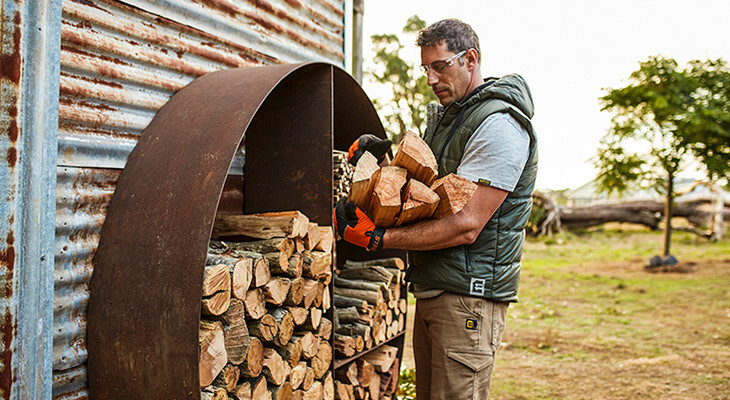 STIHL batteries are custom engineered to include a host of advanced features, including LED charge indicator lights, specialized voltage monitors and temperature sensors to help ensure optimal operation and long service life. STIHL lithium-ion batteries retain over 80% capacity even after 500 charges. They are designed to operate at full speed until depleted – no gradual drop in power during use. Trees and shrubs will often take the brunt of the winter elements, so take a closer look for any broken branches that have been damaged by snow and ice and prune them. Remember, it is okay to have a professional arborist out if you do not feel comfortable! Damaged trees are more susceptible to insect and disease infestations, so it is imperative to take care of any damage that you see. Excessive snow can cause those ugly brown patches in your lawn, so take some time to rake away some of the brown grass, but just enough to see the lawns surface. If you can see some green beginning to emerge, you are in luck! Your grass should recover with time. If you notice that this area is not greening up like the rest of your lawn, you may need to put in a little extra work. To repair this spots, rake the area and bring up as much of the dead grass as you can and then add a light layer of topsoil. You will then need to use a quality grass seed for that thrives in your local area. If you do not know what type of grass will work best, stop by your local garden centre, they are a great resource! After seeding the area, keep it moist with daily watering. Another common winter grass killer is the salt we use on our sidewalks and driveways. Follow the instructions above to remove the brown grass and repair. Watering your lawn daily to flush the salt from the soil will also help to restore the troubled areas. Any lingering snow or moisture, especially with leaves from the fall left on your lawn, can cause mold. It generally should go away on its own; however a firm raking should do the trick to alleviate any damage. Putting in some work on the trouble spots in your lawn will save you headaches – and more work – when the warmer weather of summer sets it. A bonus is getting it done early so you can sit back and enjoy your lawn in the beauty of the spring! As always, make sure you’re wearing the correct Personal Protective Equipment and please follow the correct operating instructions as recommended in the owners manual of your axe. With a chilly winter well and truly underway, it’s important you’re across everything there is to know about collecting firewood in your local area and how to maintain your tools throughout the season. 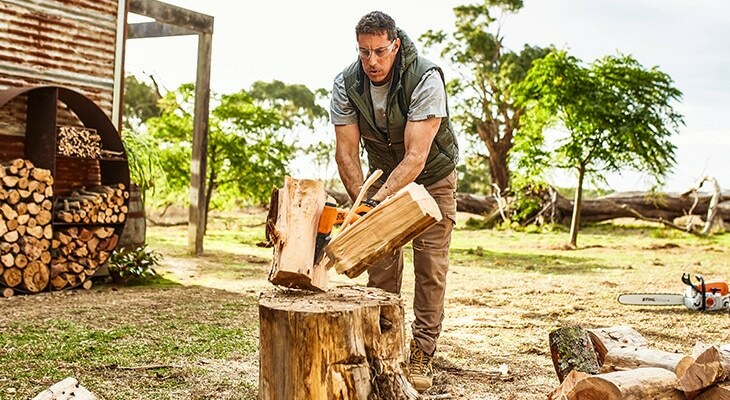 This winter, we took some time out with professional woodchopper and one of our STIHL TIMBERSPORTS® athletes, Brad De Losa to find out his top tips for gathering firewood, and how to chop it safely throughout the season. Rules in different states, and even within states, vary widely. Make sure you check in with your State or Territory’s forestry authority to make sure you’re collecting firewood safely and legally. 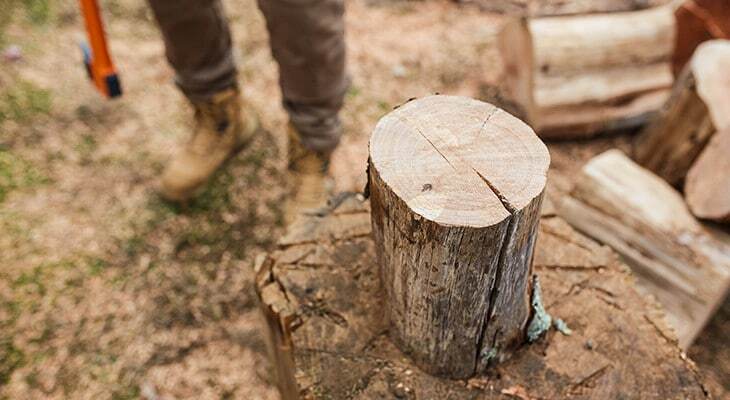 Once you’re across your local requirements, seek advice on what to look for when you’re gathering wood for your own fire as different forests contain distinct types of wood. When you’re ready to start collecting, keep an eye out on the bush floor and any dead or dry branches for burning. 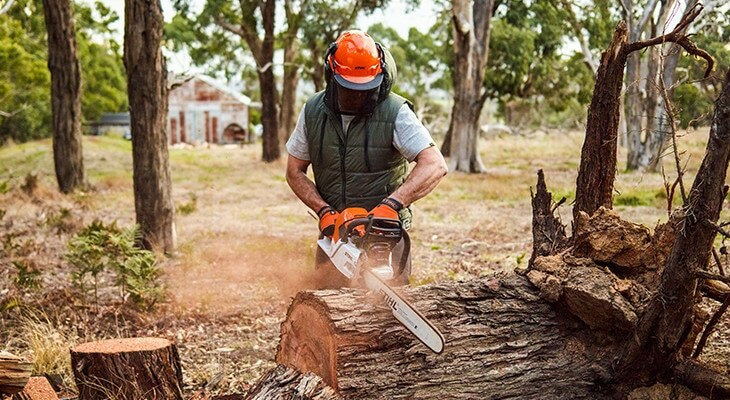 Make sure you have the right chainsaw for you and the job. Two examples are the MS 170 MiniBoss for homeowners or the new MS 661 C-M Magnum for the big jobs. 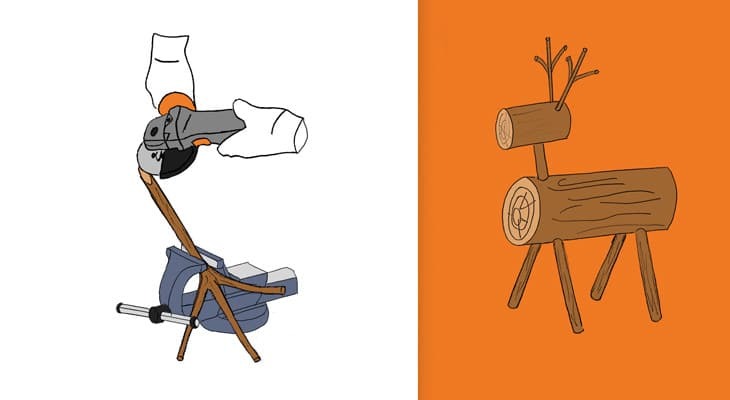 Seek advice from your local STIHL Specialists if you’re not sure. It’s important to get your chainsaw serviced at least once a year, before you commence any project such as wood chopping. This ensures the saw is in safe working order. 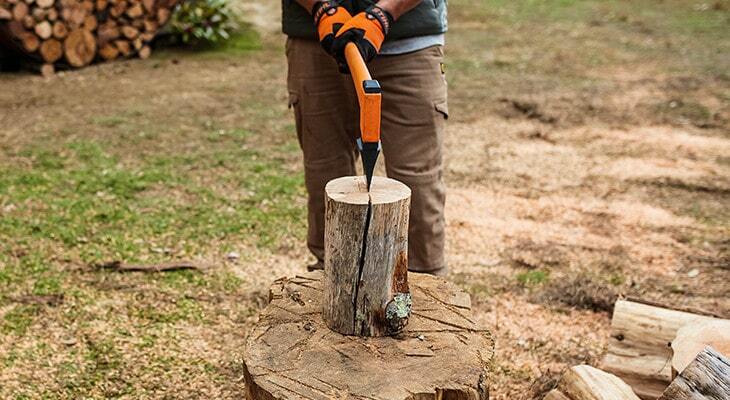 You can get any chainsaw checked and serviced at any of our local STIHL Specialists. Always wear protective gear when you chop wood. Clear your workspace of other branches or debris. Always start your chainsaw on the ground, after checking your chain tension and chain break. 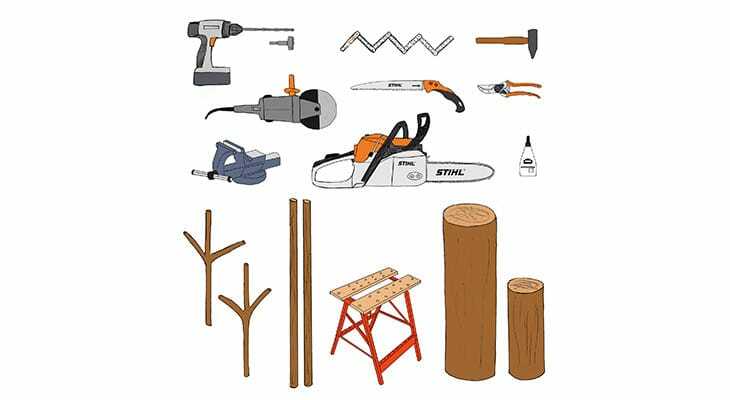 Mark your collected branches to the length of your fireplace and use your chainsaw to cut them into manageable logs. 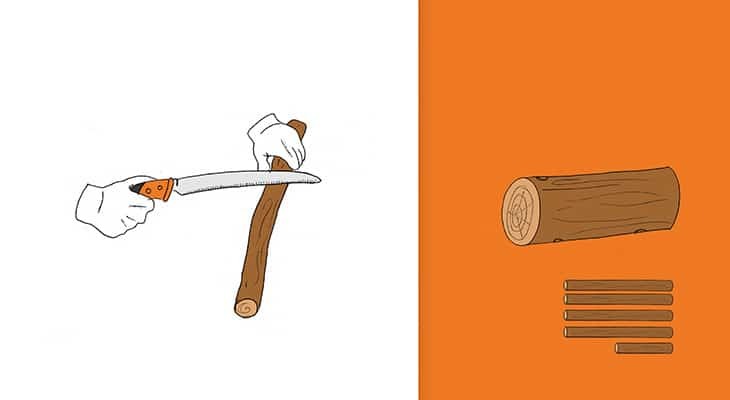 Split the logs with an axe by aiming for the grain of the wood and cracks or imperfections. Never swing the axe over one shoulder. Always swing overhead and use your body weight to bring it down onto the log with precision. If there are any cracks in your axe handle do not use it as the head could come loose and cause an injury. 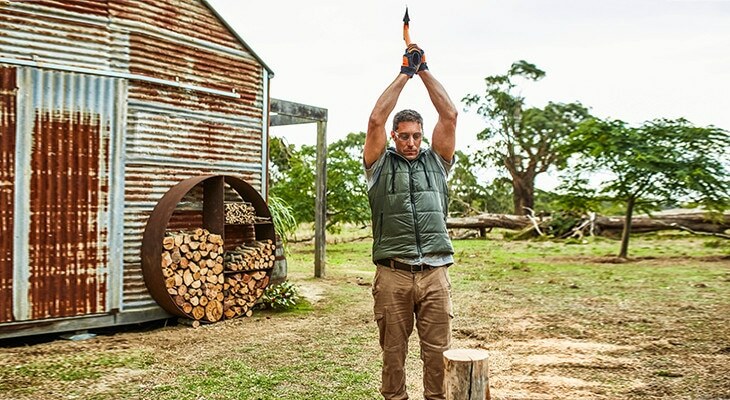 The STIHL Splitting Axe with fiberglass-reinforced polyamide handle will not separate from the head of the axe. Stack your wood to promote airflow, so the wood is dry and ready for your fireplace. The reindeer’s body can be made with any kind of hardwood, and the legs and neck can be made from larger branches from the ground. For the antlers, choose forked, thin branches to create a lifelike look. TIP: While glue can be used to make your reindeer more stable, it does not dry easily on damp wood, so we recommend using dry wood if you wish to use glue. If you only have access to damp wood, put the reindeer together first and glue the parts in place once the wood has dried. 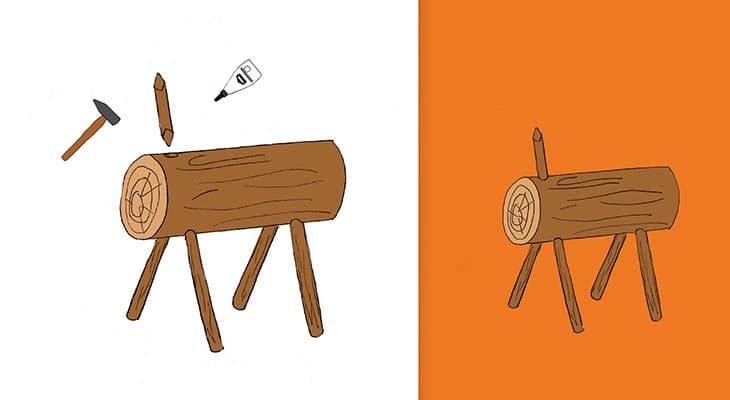 For a larger reindeer, place the 20cm log on your sawhorse or workbench, and measure a length of approximately 60 cm. Mark this length using your chainsaw or a suitable marker, such as chalk. Position the trunk and fix it in place so that the shorter end from the mark extends over the edge of the workbench. 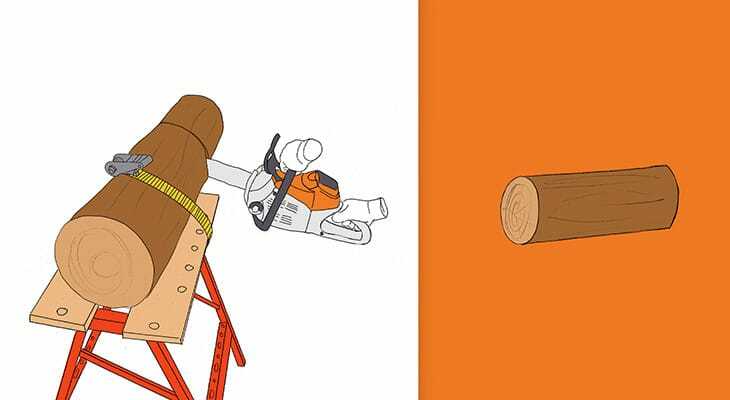 Using your chainsaw, cut approximately two thirds of the way, then turn the trunk over so you can make the final cut from above. Be careful not to cut the full way through, as the piece being removed may break off early and splinter. 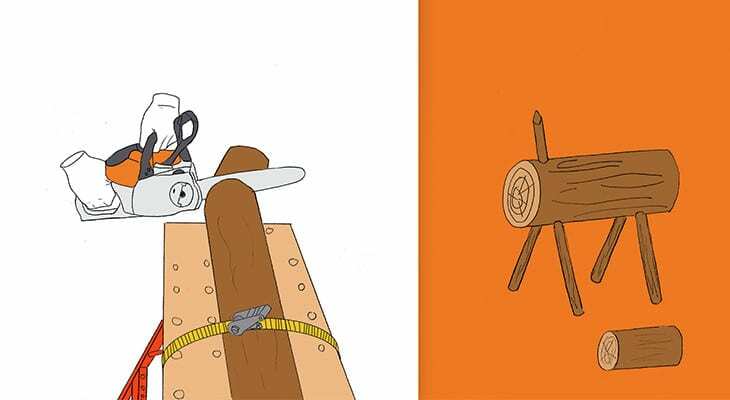 Once you have your body section complete, place your log evenly on your sawhorse or workbench. Using a drill, make four holes in the log for the leg pieces. As a guide, these should be approximately 45 degrees from the centre of the log and 5cm deep. 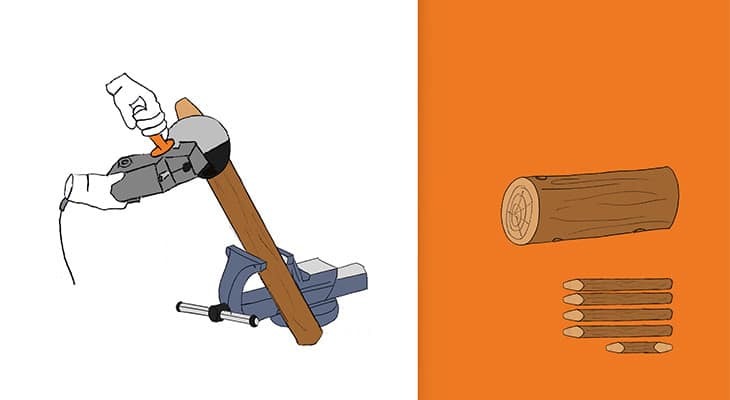 Once you’ve done all four, turn the log over and drill a 5cm hole for the head. This should be on a very slight angle, but straight enough to support the weight of the head. TIP: When choosing a drill bit, use the diameter of your leg and neck pieces as a guide, and select a bit that has is slightly smaller. Using your 5cm branches, prepare the leg pieces by cutting them to approximately 40cm in length, and another 20cm length piece for the neck. A smaller battery or petrol chainsaw is suitable for a branch of this size. Use a vice to clamp the branches in place so they don’t move around, and taper one end of each of the legs and both ends of the neck piece. Don’t make the ends too sharply pointed, and be sure to you test them for fit against the relevant holes to make sure they’re snug. If you’re using dry wood, apply some glue straight into the four drilled holes and use a hammer to gently tap the legs into the body. Once the glue has dried and the legs are in place, stand it up, and repeat the same process for the neck piece. If your wood is still damp, assemble the parts without the glue, and add glue later one the wood has dried. 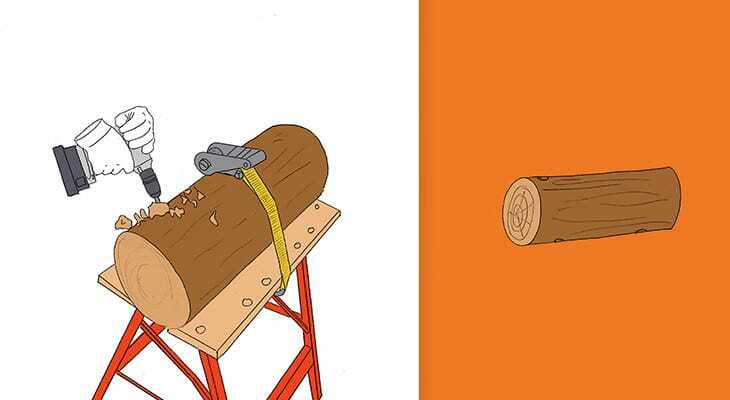 Please your 10-12cm log onto your sawhorse or workbench, and mark a length of approximately 25cm. As we did with the body, cut approximately two thirds of the way through, then turn the trunk over so you can make the final cut from above. Drill a straight hole for the neck in the lower side of the head section so your reindeer holds its head at a natural angle. 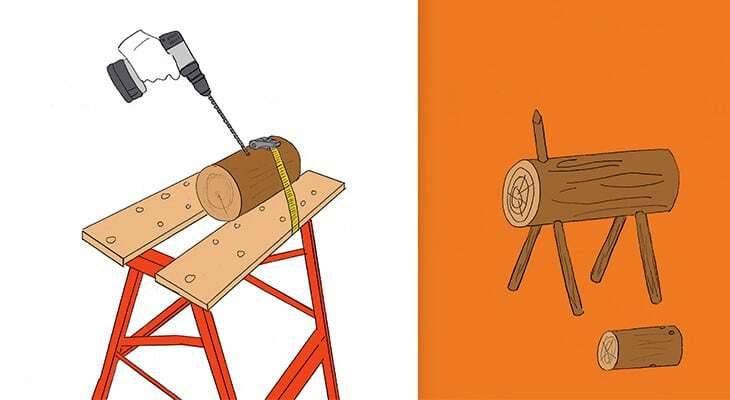 Turn the log over, and drill two holes using a smaller drill bit for the antlers. These should be angled slightly towards the center of the log. Use your pruning shears to remove any unwanted leaves and smaller twigs from your antler pieces, then taper the lower point of each brand using your angle grinder. Once done, attached the head to the neck piece, and the antlers to the head. Don’t forget to upload to a picture to your socials when you’re done and tag @hobdenssmallengines for Instagram & Facebook. For a better, vibrant lawn this spring and summer, treat it to a regular feeding and watering. Apply a high nitrogen slow release fertilizer. Some fertilizers need only be reapplied between 6 to 12 weeks. For a thicker, healthier lawn, mow it as regularly as once a week – it also means it will generally need less water and less fertilizer – less time maintaining, more time enjoying. STIHL’s cordless lawn mowers, the RMA 370, RMA 410 C and RMA 510 will make light work of any mowing job – they are lightweight and simple to use. Simply pop in the charged battery, press start and mow away!